Alright guys, Thanksgiving is behind us, and along with it all the buttery stuffing, gravy-sogged turkey, both kinds of pie, and excuses for “just one more” glass of wine (“My family drives me to drink”/”The holidays drive me to drink”/”Whatever, I’ll just do sober January” … take your pick). It’s time to get back to our regularly scheduled programming, especially since the season of holiday parties (and hence, holiday dresses) is mere days away. So, I’m sharing what I eat on an average weekday. I drink the same breakfast smoothie almost every day, based on the Fab Four Smoothie formula, and here’s what’s in it: one heaping handful of organic baby spinach, 1 cup unsweetened almond or cashew milk, 1 scoop vanilla coconut collagen protein powder, 1 TBS almond butter, 1 TBS flaxseed, 1 TBS chia seeds pre-soaked in water, ¼ cup frozen organic blueberries, 2 ice cubes. I blend it in the Vitamix, seal it in a mason jar, and drink it at the office. If I’m running late or the Vitamix is dirty, I’ll grab the Epic Green smoothie from Project Juice (obsessed). The concept of a power bowl is simple – it’s any combination of roasted veggies, legumes and cooked grains you have on hand, topped with a healthy dollop of hummus and a big scoop of avocado. Typically I roast a big batch of veggies on Sunday and make either a pot of quinoa, farro, or black beans, then reheat as the day goes on. My favorite roasted veggies to include: broccoli, chickpeas, sweet potatoes or butternut squash, red onions and bell peppers. Also, after lunch I usually eat two or three chocolate-covered pretzels because I have a raging sweet tooth. Chalk this one up to laziness, because both of these options are just steps away in the Salesforce kitchen. I’ll either grab a heaping handful of trail mix, or slice up a banana and top it with a packet of Justin’s Honey Peanut Butter. This one varies, and we for sure don’t have fish every night, but after my trending vegan journey started we pretty much never cook meat at home anymore, so that leaves seafood, veggies, and grains. A few easy options are salmon tacos or whole-wheat pasta mixed with zoodles and shrimp. We also get Gobble meals like pan-seared tilapia with garlic cilantro rice delivered (kinda like Blue Apron but wayyy faster to make). Oh, and I also can’t get enough of this vegan mac and cheese recipe with broccoli. I require a little dessert every night (remember, I have a raging sweet tooth), and I love to bake, so most weekends I whip up something sweet to carry me through the rest of the week. After dinner, in front of Bravo (fine, sometimes E! ), I’ll have a mini ramekin of healthy chocolate chip cookie dough, a black bean brownie topped with almond butter, a raw date, coconut and cashew ball, or another healthy dessert. Posted on November 27, 2017 by Sarah Boutin and filed under Food, Lifestyle and tagged Food Lifestyle. Apricot-hazelnut granola recipe: Made this last weekend and it is SO. GOOD. Hallelujah! Lower prices at Whole Foods: From eggs to bananas, your full list of cheapies. 10 healthy eating Instagram accounts to follow: Bring on the food inspo. How to sleep like a baby on airplanes: Attempting all these on my flight to NYC tonight. 9 new things to buy at Trader Joe’s in August: Coconut cold brew, onion salt and more. What to expect at your first SoulCycle class: Lots of sweat, little personal space. Kitchen tools to save and splurge on: Guess I didn’t need that $150 cast-iron skillet. For more of my favorite links, follow me on Twitter. Posted on August 31, 2017 by Sarah Boutin and filed under Roundups and tagged Roundups. Five fabulous things I’m loving this week. I just discovered this adorable hole-in-the-wall natural cafe and juicery in the Mission and I. AM. OBSESSED. The vibe is cozy hipster bohemian and the menu is out of control - goji turmeric smoothies, chia seed and hemp oatmeal, raw vegan cheesecake, you get the picture. I had the citrus hazelnut kale salad with figs, carrots, sprouts, oranges, toasted hazelnuts and avocado (above), and the quinoa bowl with roasted veggies was also amaze. Can I move in? I’ve been going to Soul off and on for years, and have always defaulted to the 3 pound weights (and P.S. they are not easy – we’re talking about tons of fast-paced reps). But a few weeks ago I was there with my friend Megan (who’s preggers and fitspo to le max), and saw her immediately go for the 5s. So I figured, what the hell. Yes, it was harder. Yes, I had to stop to rest a few times. But it felt so good to push myself and I know I’m going to keep coming back for more. Check out this article to see if you’re ready to go up in weights. Back when we lived closer to the Marina, I used to run constantly … to the Golden Gate Bridge, to the Ferry Building, up and down the slopes of Russian Hill. Since we moved to Noe Valley, I’ve fallen out of the habit. My excuse: there are too many hills and too many crosswalks (I also don’t have my running buddies nearby to hold me accountable). But recently I discovered a beautiful 3-mile loop from my house through Glen Canyon Park. It’s a trail run with wooden steps and inclines, forest paths, and gorgeous views, and feels like you're not even in the city anymore. I’m hooked again. It’s summer, which means sun, which means beaches, which means bikini season. But honestly, I already own a TON of bathing suits, and in foggy San Francisco I really don’t need any more. So I’ve been ordering a few fun, insanely cheap bikinis online … for like, $13. Yeah, they’re probably going to fall apart after a month, and yeah, the sizing and fit leave something to be desired. But they satisfy my shopping urge, are great for mixing it up in pix, and keep me from breaking the bank. My latest purchases: this, this, and this. Work stress (at least for me) is a fact of life, so lately I’ve been proactive about finding more healthy ways to deal with it. My latest relaxation technique is soaking in an epsom salt bath. You can buy the salts anywhere (I got mine at Walgreens) and they boast a host of health benefits – they break down into magnesium and sulfate in the water to help ease pain sore muscles, improve sleep, reduce stress, flush, aid your body’s absorption of nutrients, and treat everything from psoriasis to bruises. Plus you’re lying in a hot bath which is heaven anyway. Sold. Posted on August 25, 2017 by Sarah Boutin and filed under Roundups. How is it August already? No clue, but summer is flying by and I’m not sure how I feel about that. Luckily, we’ve got another whole month until Labor Day, which means we’ve still got time to work on our summer bodies (which is definitely needed since I spent last weekend eating steak, cake and champagne, it’s fine). Enter the August Plank Challenge. This 30-day program will take you from a 20-second plank to a 5-MINUTE PLANK! I know. I know. Five minutes sounds like an eternity, but let me tell you – I did this challenge last year, and after doing a 5-minute plank you feel seriously badass. And, not only are planks an awesome core conditioning exercise, but they work your glutes, hamstrings, quads, obliques and help give you fab posture and balance. 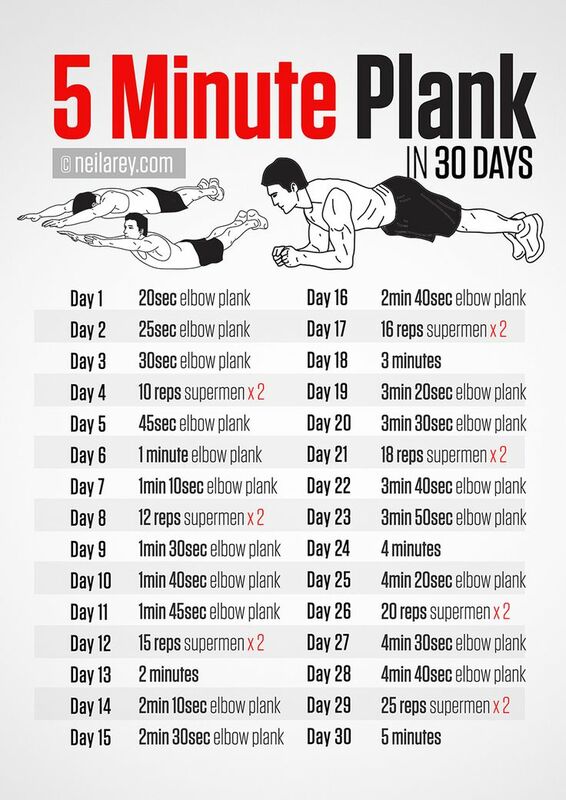 Start today, August 1, and you’ll be rocking Navy Seal-esque planks come September, straight up. Use padding. Spending up to 5 minutes on your elbows on a hard surface is not fun. Get thee to a yoga mat, or plank on a folded blanket or towel. Form is everything. Your form will make the difference between an effective plank that works the right muscles, and a potential injury. Keep your neck and spine long, eyes gazing down at your thumbs, shoulders right over your elbows, abs pulled up and in, heels shooting back behind you. Learn more here. Mix it up. Keep things interesting by adding variations to your plank: dip your hips from side to side, bend one knee down to touch the floor and then reverse, step your feet out and in again, or pop up to your hands for a minute. Distract yoself. It’s absolutely critical to provide a pleasant distraction, or those 5 minutes will feel like 5 hours. TV is a no go since proper form requires you to be staring down at the floor. Enter YouTube videos on your cell phone! They’re usually several minutes long already (at least), and you can nestle the phone right between your elbows. My fave is watching abspirational music videos - Britney, Christina (back in the day), Shakira, J.Lo, Beyonce. Listening to podcasts or the radio are also acceptable. Breathe! You’ll never make it through the challenge if you’re not getting enough oxygen. Take deep breaths in through the nose filling the lungs, and out through the mouth. Alright what do you say? Are you with me? Posted on August 1, 2017 by Sarah Boutin and filed under Fitness and tagged Fitness. Le sigh. It’s over?? Really? I spent the month of April traveling around Europe (three weeks with Kevin, one week with my good friend Kay). We hopped around Italy’s Amalfi Coast and Croatia; explored the winding streets of Amsterdam, London, and Paris; and indulged in the pleasures and leisures of Provence. I logged up to 26,000 steps a day, drank wine at lunch (and dinner, and in between), read a ton of books, forgot what TV shows I’d been watching, and didn’t glance at my work email once. I threw my everyday to-dos (Eat healthy! Work out! Cook! Clean! Grocery shop! Be a productive member of society!) out the window and in true DGAF style, just did whatever the hell I wanted. It was, in a word, glorious. The best part was that the entire time I felt so much more open to new experiences. My attitude was, bring it on – all of it. It was a yes to everything – yes to croissants, yes to seeing every old cathedral, yes to a jog through the polished streets of Dubrovnik. And although #vacationlife may be over (sob), I hope to bring more of that mentality into my regular life and continue to embrace the new, the different, and the “why nots” of the world. From Bacvice Beach in Split to Hyde Park in London, the towers of Notre Dame to the crevices of the Anne Frank house, there were too many memorable moments to count. So, this is the highlights reel. Let’s start with food. Obviously. Gone in 60 seconds. That was the story of my insanely delicious (and cheap) falafel, eaten in the Jewish quarter of the amazing Le Marais district. Kevin’s gyros were equally fab. So much yum. A fancy (but not pretentious) three- or four-course dinner, complete with divine authentic Italian food, live music, great service, and a potential Mafioso at the table next to us. We sat out on the sunny front patio, had a deliciously fresh pizza with gooey cheese – plus a bottle of white wine – and watched the passers-by down the main drag of Amalfi. Cheap, yummy, relaxing, all around bomb. Provence is the birthplace of rosé. Or at least it feels like it is – crisp, blush-colored bottles line shelf after shelf of grocery and corner stores, and you can get them for 2 Euro a glass at the many sun-soaked patios that line the town’s winding streets. Heavenly. Il Sentiero degli Dei is a famous winding 3-hour hike along the Amalfi Coast with breathtaking views (and sheer cliffside drops that almost induced several panic attacks/tears from yours truly). We hiked from Praiano to Positano, starting with a 1,000 mile stair climb. I never thought it was possible for a watery cave to actually glow. But this one does, and it's breathtaking. We paddled through the grotto mouth in a tiny rowboat (manned by a wiry Italian singing a deep baritone), then floated in awe on the sparkling, mezmerizing azure waters. Do you hear the people sing? Singing the songs of angry men … okay I’ll try to contain myself here but I am clearly a HUGE Les Mis fan. This show at the Queen’s Theatre exceeded my incredibly high expectations. Vive le France! Okay, so Dubrovnik was pretty much our favorite stop of the trip (message me for more – I can go on). Medieval walls encircling breathtaking red-roofed homes, hugged on all sides by the bluer-than-blue Adriatic Sea. Look familiar? You’ve probably seen it on Game of Thrones. This was my first time to Amsterdam, and I could NOT get enough of the fairytale cottage houses, meandering canals, tiny bridges, and bikes, bikes, bikes everywhere. Every turn brought something beautiful and new. Where do I even begin. Versailles is like a castle on crack. Luxury upon luxury, lavish and ornate everything, pristine gardens that extend as far as the eye can see (with plenty of opportunities to eat, boat, bike, and sun). Louis and Marie definitely knew how to live the good life. (Runner-ups: the ash-preserved city of Pompeii, Italy and the charming fishing village of Cassis, France). Posted on May 29, 2017 by Sarah Boutin and filed under Lifestyle and tagged Food Lifestyle.